Equipment: satellite TV; DVD; internet access Wi-Fi (included); washing machine; electric heating; underfloor heating (only in the bathroom/s). detached house, 6 people, 4 room/s, 3 bedroom/s, 1 bathroom/s, approx. 120 m², 2 floor/s. Kitchen: Kitchen/ cooking equipment: 4 electric plates, oven, dish-washer, refrigerator, coffee machine, water boiler, freezer box approx. 400 litre. separate (ground floor). Living room: (ground floor): furniture suite, wood-burning stove, exit to terrace. From the living room stairs to upper levels. Estate: (private use): open plot, natural surroundings, meadow, fruit trees. Fishing: fish-processing table roofed, with running water. good fishing possibilities. Outdoor facilities: (private use): balcony, furnishing provided, transportable barbecue. Situation: in the hamlet Tjugum, fjord view, view of Sognefjord. Arrival: Airport Bergen Flesland in approx. 186 km. Ferry port Bergen in approx. 187 km. Train station Flåm in approx. 110 km. Beach/waters: Fjord (without crossing the street) in approx. 120 m (Sognefjord). Bus stop: Bus stop in approx. 200 m (Tjugum). Next village/town: Center Balestrand in approx. 8 km. Høyanger in approx. 53 km. Sogndal in approx. 38 km. Shopping: Next supermarket (Balestrand) in approx. 8 km. The house is large and comfortable with three upstairs bedrooms. 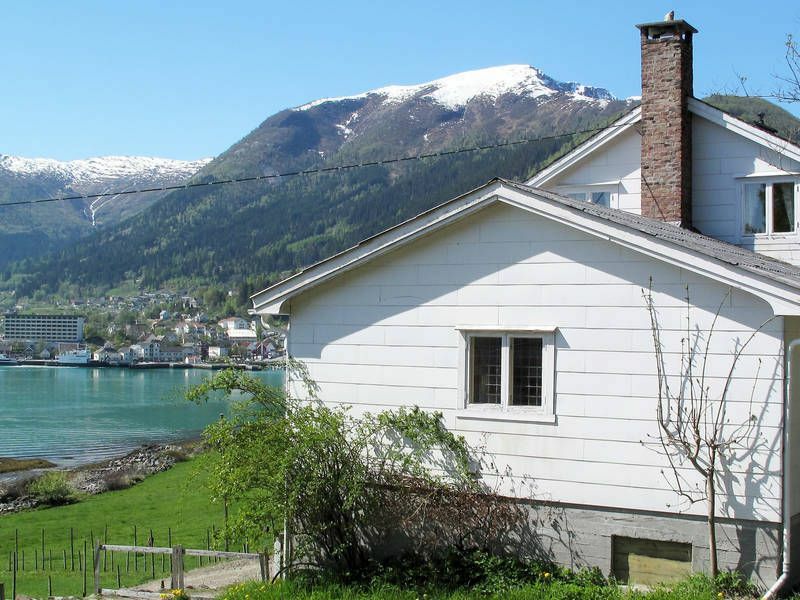 The house has a large deck facing the town of Balestrand across the Fjord. The kitchen was well equipped . The dinning room is open to the living room which makes the home fell very comfortable. The house is across the Fjord from Balestrand and only a mile from Dragsvik where you can catch ferries to route 13 and 55. Praktisch huisje, met balkon dat uitgeeft op het water, steeds een prachtig zicht! Voldoende ruim, beetje ouderwets ingericht maar stoorde ons niet. Kamers en badkamer dik in orde, een fijne plek om als gezin te verblijven! Balestrand is vlot bereikbaar. mooie aanlegsteiger voor de bootjes beneden het huis, waar onze kinderen ook gezwommen hebben. Charmante plek.